Eugenio Scalfari (Italian: [euˈdʒɛːnjo ˈskalfari]; born 6 April 1924 in Civitavecchia) is an Italian journalist, editor of the news magazine L'espresso (1963–1968), former member of parliament in the Italian Chamber of Deputies (1968–1972), co-founder of the newspaper La Repubblica and its editor from 1976 to 1996. In 2018, he wrote an article related to his interview with Pope Francis stating that the pontiff made claims that hell did not exist. He later admitted that some words attributed to the pontiff "were not shared by Pope Francis" himself. A law graduate with an interest in journalism and politics, Scalfari worked for on the influential postwar magazines Il Mondo and L'Europeo. In 1955 he was among the founders of the Radical Party. In October 1955, jointly with Arrigo Benedetti he co-founded one of Italy's foremost newsmagazines L'Espresso with capital from the progressive industrialist Adriano Olivetti, manufacturer of Olivetti typewriters. 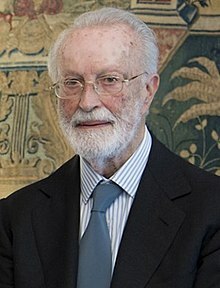 The experienced Benedetti, who had directed the newsmagazine L'Europeo (1945–54), was the first editor-in-chief until 1963, when he handed over to Scalfari. In January 1976 the Gruppo Editoriale L'Espresso also launched the centre-left daily newspaper La Repubblica in a joint venture with Arnoldo Mondadori Editore. Scalfari became the editor-in-chief and remained so until 1996. Few believed such a venture could succeed in the already crowded Italian newspaper market, but under Scalfari’s skilful editorship La Repubblica prospered to the point of rivaling the prestigious Corriere della Sera in both sales and status as a national daily. He remains active in both La Repubblica and L'Espresso. He has also published a number of books including l’Autunno della Repubblica (Autumn of the Republic) (1969) and the novel Il Labirinto (The Labyrinth) (1998). As a journalist, he was especially active in investigative reporting, uncovering illegal right-wing activities and major government cover-ups. With Lino Jannuzzi he uncovered the attempted 1964 coup d'état by General Giovanni Di Lorenzo in May 1967. In July 2014, he reported, in an interview, Pope Francis's controversial statement that approximately 2% of the Catholic Church's total number of priests, including bishops and cardinals, were pedophiles. Initially, like a lot of Italians of the time, Scalfari was a sure fascist, and described himself like "Young, happy and fascist". After the Second World War, Scalfari was near to the Italian Liberal Party, but in 1956 he participated to the split out the party of the "Radicals" (leftist liberals), like Marco Pannella and Ernesto Rossi, that formed the Radical Party. In 1968, Scalfari was elected to the Italian Chamber of Deputies (1968–1972) as an independent aligned to the Italian Socialist Party (PSI) and handed over his post as editor to Gianni Corbi. Scalfari described himself as libertarian, but also "liberal of social mold". He has been a pro-choice in the referendums of 1981. Later, was a critics of the Silvio Berlusconi's political action, but more moderate respect the current positions of "La Repubblica". He is an atheist. In 2013, he received a personal and detailed explanation from Pope Francis about atheism and forgiveness. Wikimedia Commons has media related to Eugenio Scalfari. ^ "Personal information and assignments in the V Legislature". Italian Chamber of Deputies. Retrieved 26 September 2009. ^ Chieffi, Daniele (3 April 2009). "Eugenio Scalfari: Repubblica e il compleanno di "barbapapà"". Nanni Magazine. ^ Scalfari, Eugenio (16 January 2012). "Come si declina la parola libertà".